The reality is that getting any map information to show up on an actual map can sometimes seem like such an insurmountable hurdle that when it happens we are tempted to up and call it a day. Maybe it’s the first time you’ve tried writing Mapbox GL JS from scratch and applied it to tiles you’ve tried to cut yourself. Maybe it’s the first time you’ve used AGOL or tried to import a map into Illustrator to manipulate. Whatever the process to make the map, the process can be a very difficult thing. It is so tempting to simply give up once something remotely close to adequate is produced. Especially for those who aren’t mapmakers or cartographers by profession. No, you shouldn’t continue to use the original thumbnail images after the map has changed many times. No, your legend items should not contain abbreviations, acronyms, version numbers, or any other unintelligible blather. No, your pop-ups should not contain every data field known to cartographers but not to man (e.g., perimeter, objectID, area_acr_try2). 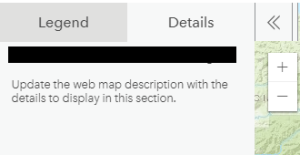 And, if you have created a series of webmaps that all go together, they should probably not all have different basemaps just because you wanted some variety. This is the video of my presentation a few weeks ago at FOSS4GNA 2016 where I live-demoed the making of a print map in QGIS over the span of 30 minutes. I hope you enjoy it! Low-resolution snapshot of the map created in the demo. Not sure what geo related merchandise to get your map obsessed loved-one for the holidays? Check out the 2016 GeoHipster Holiday Gift Guide, presented as a top 10 list, culminating of course with their GeoHipster 2016 calendar. Recognize the map on the October page of the GeoHipster calendar? It’s my Ye Olde Pubs of London’s Square Mile map. I’m thrilled to have a map in the calendar again this year! If you buy the calendar remember to select January 2016 as the starting month. New Notes and GIS Coffee! in the throes of writing QGIS Map Design, a book that’s due out in 2016. This immersive experience is giving us all kinds of fun while we use SourceTree, Git, and LaTeX in a new kind of continuous-build book writing process. This is not the way traditional publishers do it! buying coffee over at giscoffee.com. This was just announced today so it’s very recent. I bought The Experience and can’t wait for it to get here, though I noticed that they really aren’t shipping until Dec. I’m a bit confused about shipping and how this all works so I have some questions out to the owners of the site. Once I hear back I’ll probably write up a longer post. If you decide to buy now, remember to use the coupon code QMD at checkout for 10% off. continuing to support the Hood Canal Coordinating Council (See our NOAA CCAP map here!) and will even be doing some d3 for them in Nov/Dec 2015.
keynoting the Manitoba GIS User Group Fall Conference on October 7, 2015. Check out the slides. collaborating with Bright Rain Solutions and Mangrove Services to create interactive d3 charts for an NGO. See this in action here. I previously wrote about Mark Twain’s Paris Map but I don’t believe I had come across this particular account of it in his autobiography at the time. I’ve been re-reading the autobiography lately and when I read the bit shown below I figured I should pass it along. It sets up the reasons why he made the map–in a fit of creativity resulting from the somberness of having just taken care of two people who ultimately died–and also goes into what he (imagines?) the map’s effects were on those who saw it. By an unimportant oversight I have engraved the map so that it reads wrong end first, except to left-handed people.